Air Jordan VIII Ray Allen Boston Celtics "PE"
The Ray Allen PEs keep coming, and we have no problem with it. 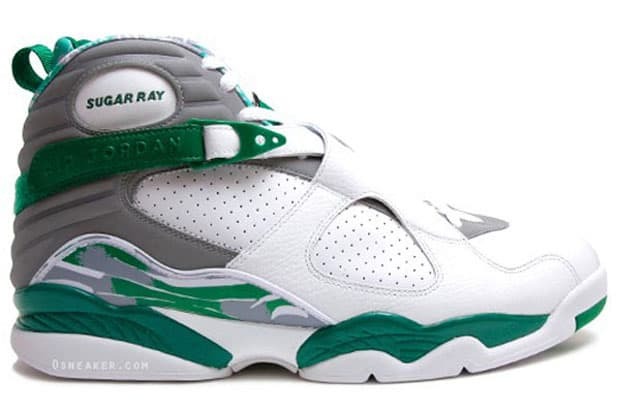 The latest PE to surface is the Air Jordan VIII, and its dressed in mainly white with gray and green accents. Everything is done up for Ray Ray except for the 23 on the midstrap which still shows love to the originator. If you&apos;re a size 14 you&apos;re in luck — head over to OSneaker to buy this dope PE.